1. If you are in the Philippines, send your old iPad to New Media Services Philippine office: Rossking Pty. Ltd., Ground Flood Standard Factory Building No. 1, Baguio City Economic Zone, Loakan Road, Baguio City. 2. If you are in other areas, you can send your old iPad to New Media Services Pty. Ltd.: 4 Dundass Grove, Botanic Ridge, Victoria, Australia. 3. You can purchase a refurbished iPad on any Apple store. Visit http://store.apple.com/us for online purchasing. 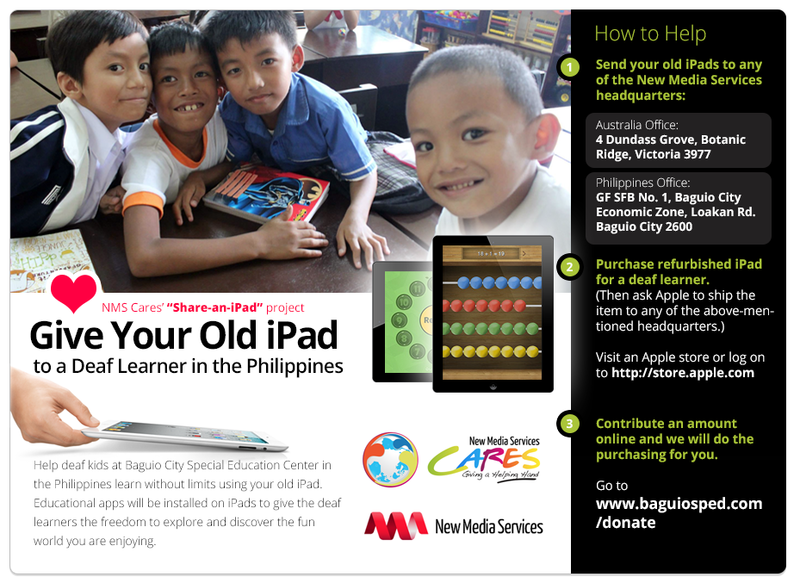 To non-iPad owners, you can also support our cause by sharing our links with your family and friends. The iPad works perfectly as a tool for deaf children to communicate with each other, learn how to read and write in a more entertaining way; and these gadgets provide a specific skill-set which could prepare them in facing the tough world. However, iPads remain out-of-reach among deaf learners in the Philippines. In the government-owned Baguio City Special Education (SPED) Center, deaf learners still use the traditional book and blackboard methods every day. These are more often than not, outdated. Lucky are those whose parents can buy updated learning materials and tech products that aid their children in understanding their lessons in school. While the deaf learners are on summer vacation this April and May 2014, New Media Services would like to invite everyone who has just upgraded or replaced their iPad to donate their old or unutilized units for the benefit of these deaf learners. The old iPad units will be installed with a list of education applications that can help the deaf learners in their Math and English subjects. We hope to have the first set of iPads released to third graders studying at the Baguio SPED Center as our primary beneficiaries. In the past years, we already helped with “little miracles” to the Hearing Impaired Sequence of the school by renovating and refurnishing their classrooms, donating computers, sponsoring their Internet connection, providing learning materials- all things that the government could not easily provide as of the moment. With your help, we can do a whole lot more good! You might think that the old iPad in the corner of your room collecting dust is just a simple gadget; but that old iPad can be a key to fruitful learning sessions that will change the lives of these deaf kids in the Philippines. To donate, you can send your old iPad units to our Australian headquarters located at 4 Dundass Grove, Botanic Ridge, Victoria, Australia. We will handle the shipping expenses of the units to the Philippines. You can also support the Hearing Impaired Sequence of Baguio City SPED Center by donating through this link: http://baguiosped.com/donate/donate/home. For questions and suggestions, email us at [email protected] now. New Media Services is not just Australia’s leading provider of end user support services and cloud-based messaging platforms. NMS is also the leading advocate of improved deaf education in the Philippines. For years, NMS has consistently supported the Hearing Sequence of Baguio City Special Education (SPED) Center and out-of-school youth in the Philippines. To know more about the charitable activities of NMS, please visit http://newmediaservices.com.au/nmscares or email us at [email protected] now.